I follow a different spiritual path than the Catholic religion in which I was raised. I now consider myself Pagan, with an understanding that God/s cannot be stuffed into little, clearly defined roles (where it just happens to look like Charlton Heston). Among the things I have experienced along my path is a bit of shamanistic exploration, which was a challenging thing for me. I learned that my body/mind does not shut down/open up well with laying-quiet-while-drummers-drum. The whole shamanic journey experience escaped me for a half year or more. Then I accidentally discovered that I could get to that ready-state through ecstatic dance. I learned that if I exhausted my body then my mind was free to roam into other realms. So for my first successful journey, having worn my physical self out, I went seeking my spirit guide, my totem animal. I knew I was on a real sort of experience when I met that guide. Had I been consciously choosing my totem animal, there is no doubt it would have been some big cat - lion or tiger, lynx, jaguar or some such. 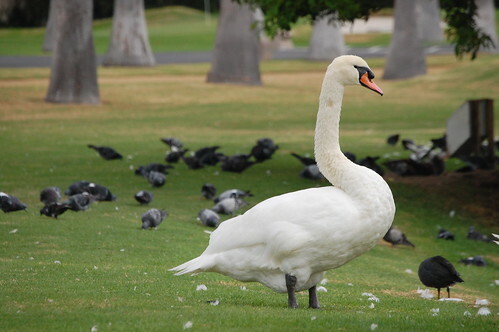 No, the animal who did show up on my journey - complete with the psychic equivalent of the blaring of trumpets - was Swan. 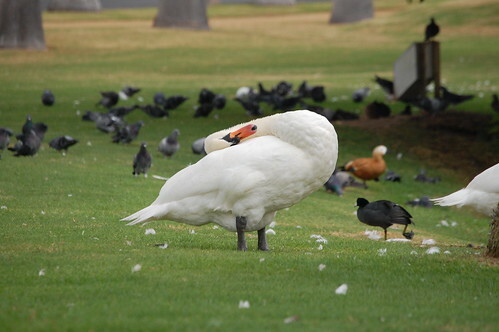 So this weekend I was being a temporary bachelor at a wedding in San Diego, and lo and behold, there were a couple of swans, with a cygnet, to remind me that (among other things) Swan is a teacher to remind me of loving sexual relations. So there I am, 2000 miles from home, and all I think about is missing Reena, my dear partner. There it is, my friends. The perfect reminder for me about what my delightful relationship with Reena is all about. So many people seem to want to get away from their partners, have a chance to be wild or whatever, and for me the time away just means that I miss my playmate, my best friend. Spirit guide indeed.